Sound Instruments - Sound Therapy - Sound Energy. Sound created by singing bowls, drums, flutes, string instruments and many others described in this book, can produce healing effects. Many music therapists and sound healers have been using this knowledge with success. Working with sound healing with the aim of harmonising body, soul and spirit is more complex than just working with music or using sounds. Our consciousness is the key to lasting changes. Sounds can work as "keyholes". The system of the five elements - earth, water, fire, air and space or ether - creates a comprehensive approach to using sound that integrates body zones, emotions, thought patterns as well as the subtle anatomy, the energy fields of the human being. In working with sound healing we need to find the right sounds for a person. Someone 'earthy' may need some 'firey' sounds and instruments to get a step further, while an 'airy' person may need more 'earth', more 'grounding'. 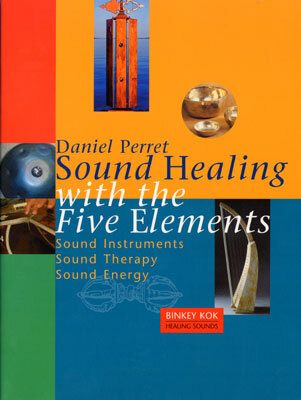 Daniel Perret learned how the use of the ancient wisdom of the five elements can produce a harmonic balance. This is a practical handbook for therapists and any interested person.